Doncaster Rovers are firmly locked in what is looking increasingly like an intriguing six team battle for the final play-off space in League One this season. They currently have the upper hand, just, occupying sixth spot, with a game in hand on most sides, although Coventry, Peterborough, Blackpool Fleetwood and even Burton at a push, are hot on their heels. After a fine run of form between November and mid-February, it looked like Rovers could challenge for an automatic promotion berth, just nine points behind second spot, until going at the wrong moment. There was no disgrace in a 2-0 home defeat to Crystal Palace in the FA Cup, but that reverse started a run of seven games without a win in all competitions. The club’s league form has seen Rovers take just four points out of possible 18, with four draws and two defeats, both coming on the road at struggling AFC Wimbledon and Shrewsbury. In fact, the away form has been a cause of concern for Grant McCann’s side, as they haven’t triumphed on their travels since a 3-1 success at Gillingham on December 29. That sequence is now up to six matches, Rovers taking just three points in that time, courtesy of draws at Blackpool, Scunthorpe and Portsmouth. It’s affected them all season too, as Donny have the worst away record in the top eight, gaining only six wins in total and losing eight of their 19 fixtures. McCann remains confident his side are well placed to finish inside the top six though, saying: “Everyone has a tough run-in I think, but at this stage of the season, it all comes down to the team that has the momentum heading into the final few games. “It’s all about who goes on that run, and we want that to be us on that run. “There’s still so many points to play for, the league is really tight. “Tere’s teams below even eighth or ninth that will still feel they have a chance of getting into that top six, and rightly so, but we just have to guard against ourselves. “We know that if we win most of our games we’ll have done enough to get into the play-offs, it’ll be an exciting run in and the boys are all looking forward to it. Team news: Luton are without leading scoring James Collins, who is away on international duty with the Republic of Ireland. Town aren’t expecting midfielder Alan McCormack to be fit for the game as he recovers from his hamstring injury, while on-loan Brighton forward Aaron Connolly is training with the Seagulls, although won’t feature, but Alan Sheehan is back after his migraine against Gillingham. Glen Rea remains out for the rest of the season with a knee injury. For Doncaster, Ben Whiteman is an injury doubt for with an ankle injury, while defender Joe Wright, also ankle, remains sidelined and goalkeeper Ian Lawlor (shoulder) is out for the rest of the campaign. Top scorers: Hatters – James Collins (20). Rovers – John Marquis (22). Man in the middle: John Busby - taken 36 games so far this term, showing 85 yellows and five reds. Has had one Luton match, the 2-1 win over Brighton U21s in the Checkatrade Trophy. Refereed just one Hatters clash last term, the 1-1 draw with Barnet in the same competition. Officiated four Luton games in the 2016-17 campaign, a 2-1 Checkatrade Trophy victory at Gillingham, plus wins over Exeter (3-1) and Morecambe (3-1), along with a 3-2 home reverse to Cheltenham. Assistants referees are Anthony Da Costa and Matthew Lee, while the fourth official is Daniel Middleton. In charge: Grant McCann – 38-year-old former Northern Ireland international, who started his playing career with West Ham, with loan spells at Livingston, Notts County and Cheltenham Town, making his move to the Robins permanent in January 2003. After over 150 appearances, was snapped up by Barnsley for a fee of £100,000 in January 2007, heading to Scunthorpe 12 months later. Signed by Peterborough in May 2010, he racked up close to 200 appearances for the Posh, going to Linfield in January 2015. Returned to London Road in February 2015 as a coach, and became manager in May 2016, spending almost two years in charge, sacked in February 2018. He was only out of the game for a few months though, appointed Doncaster chief in June. View from the opposition: Grant McCann talking to the Rovers’ official website: “They’re the best side in League One, there’s no two ways about it. “They’re on an incredible run of late, they’re top of the league for a reason, and nobody will give us a chance going there on Saturday, but we have to make sure we prove people wrong. “It’s all about us and not about Luton. “I’ve had a meeting with our analyst and it was mostly about us and the way we play, there wasn’t too much on Luton and what they do. “That’s how it’ll be from now until the end of the season, just like it always has been. “They’ve gone the whole season unbeaten so far at home in the league, they’ve been very strong, but good runs always have to come to an end at some point, and that’s our focus. Friendly faces: Town attacker Kazenga LuaLua was loaned to Doncaster from Newcastle United in March 2009. He played four times for Rovers in the Championship before returning to St James’ Park in the summer. Played for both: David Button – goalkeeper who began at Stevenage Borough, joining Tottenham Hotspur’s academy in 2003. Numerous loan spells in that time, including a move to Luton in March 2009. Never actually made a first team appearance for the Hatters, although was on the bench for the 3-2 Johnstone’s Paint Trophy final win over Scunthorpe at Wembley. Headed to Doncaster in January 2012, making eight Championship appearances, keeping three clean sheets. Went to Brentford in July 2013 and finally became a first choice, playing almost 150 times, moving to Fulham in July 2016, earning a move to Premier League Brighton last in the summer. Has made eight appearances for the Seagulls, while has also been capped at England level from U16s to U20s. One to watch: John Marquis - Striker has been a constant goalscorer in the lower leagues. 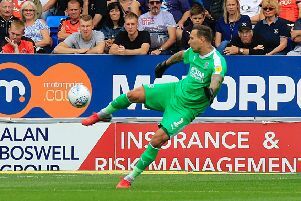 Started out at Millwall with loans at a host of clubs, including Portsmouth, Torquay and Northampton, but it was a spell at Gillingham in January 2015 where he scored eight in 21 that saw him properly noticed. Did well at Northampton in the 2015-16 season, netting six times in 15 games, before moving to Doncaster in June 2016 and hasn’t looked back since. Bagged 26 in his first season and managed 15 last term while has been in excellent form this campaign, with 22 strikes in 44 games. Like Rovers, has gone through a slight dip recently, sent off against AFC Wimbledon, scoring twice in his last 11 matches, drawing a blank in his last six outings too. We’ve got form: Luton go into Saturday’s game on the back of a lengthy unbeaten record against Doncaster at Kenilworth Road, spanning over 65 years. It had been quite even since games began back in 1947, with Luton winning the first two Division Two clashes and Doncaster taking the spoils in the next two. However, Rovers’ 2-1 triumph in December 1952 was the last time they have emerged victorious, as Town are unbeaten in the next eight meetings with six wins and two draws. In total, they have won eight, drawn two and lost two of the 12 encounters, scoring 30 goals and conceding 17. Last time out: Luton came from a goal down to run out 3-1 winners over Doncaster in League Two at Kenilworth Road in September 2016. Cameron McGeehan then tapped home at the back post from Olly Lee’s driven cross on 36 minutes, while Danny Hylton’s backheel sent Jack Marriott away to score four minutes before half time. Late in the game, Pelly-Ruddock Mpanzu was brought down in the box and McGeehan had his second from the spot to ensure victory. ylton was then sent off in stoppage time for his second yellow received when throwing a litter picker down in frustration. Hatters: Christian Walton, James Justin, Dan Potts, Scott Cuthbert (Alan Sheehan 29), Johnny Mullins, Cameron McGeehan (Alex Gilliead 89), Jordan Cook (Jake Gray 38), Pelly-Ruddock Mpanzu, Olly Lee, Danny Hylton, Jack Marriott. Subs not used: Craig King, Stephen O’Donnell, Jonathan Smith, Isaac Vassell.